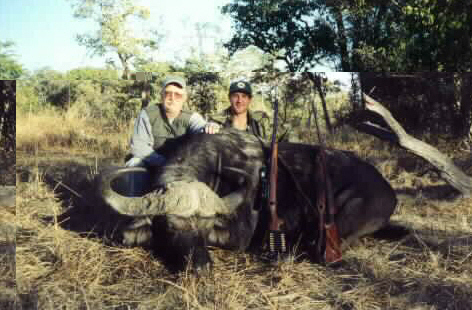 I hunted at the Dendro Ranch in Zambia with Balla Balla Safaris on July 1-7, 2000. I stayed in a very nice chalet made of reeds, with a concrete floor. The food was great, and the hunting was great as well. I was doing this hunt primarily for Buffalo, and I explained this to my PH’s Dene Bird and Ian Bruce-Miller. I wanted to take a nice one, and I wasn’t in a hurry. The first day when I arrived, there was time to make sure my rifles were still sighted in. I was using a Remington 700 in 416 Rem has my Buffalo rifle, and I had a backup rifle a Mark X Mauser (self made). Both rifles were still dead on, although I didn’t shoot very well at the target. I guess the 33 hours without sleep may have had something to do with it. The first day, we were on Buffalo right away. We stalked within 40 yards of 4 Dagga Boys and passed on them after glassing them for some time. Later that day we were on the trail of a herd of probably 2-300 Buffalo. We spotted a huge bull in the group and decided to pursue him. After being on these Buff for hours, we finally decided it was too late in the day for a Buff encounter and started back for the Cruiser. After half an hour, we decided we were lost. Bushpigs appeared in the brush ahead, and we started stalking them. Two offered a shot, and I asked Dene which one. He said the one on the left, so I quickly squatted and fired in the seated position. I knew the shot was good and stood ready for a follow up. A much larger pig appeared on the right, so I shot it going away. The solid went from left hip to right shoulder. 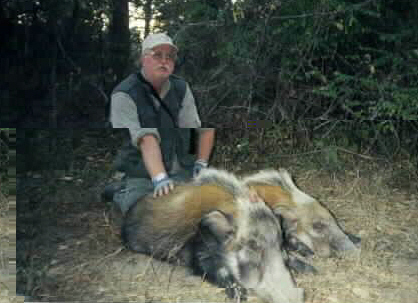 The first pig had been heart shot with a 350 Gr. X bullet. The next day, we stalked Buffalo all day. We saw the Big boy again and were on him for hours, but he never presented a shot. I also passed up several very nice Buffalo in the 37-39 class. The third day was very much like the 2nd. On buffalo all day with many nice trophies passed up. The 4th day, we left camp on foot because there had been 8 Buffalo watering within a few hundred yards of camp. We quickly tracked them down; one of them looked very nice. He has deep curls, and actually looked wider than he is. He presented a frontal target at about 70 yards. I took him offhand through the front, intentionally shooting the spine because his chest was covered by brush. He went down instantly. The 350 Gr. X bullet actually entered the spine and stayed in it for about 30 inches. Some fragments of spine were blown through the skin on the back in two places. He measures 37" with some very nice deep curls. 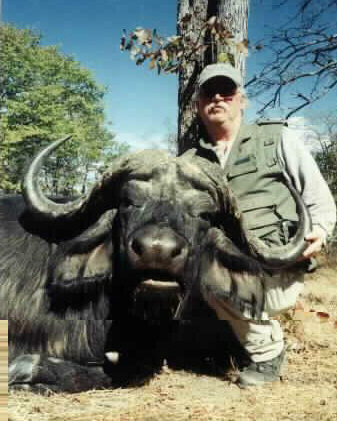 I negotiated a deal with Alan Bird, the ranch owner and Dene’s father on a second Buffalo because I prefer Buff hunting to the other things on the list (Lechwe and Puku). That afternoon, we went looking for the large herd, and got on a large herd fairly quickly in the afternoon. We stalked up to within 100 yards, and glassed Buffalo for quite some time. We saw a very large Buff, but never got a frontal view of him. We didn’t think it was the Big Boy, but this one was very nice. I decided to take him if presented a shot. After a few minutes, he presented a slightly quartering away shot at his right side. Quickly from the prone position, I put a 350 X bullet behind his shoulder, aiming at the opposite side shoulder. The bullet took out lungs and stayed under the skin on the opposite shoulder. The Bull went maybe 70 yards, and I put in an insurance solid as he laid there. He left a blood trail 6" wide. He measures 40" with 14.5 and 15" bosses. The next day I was to be Shawn Bird’s backup on his Buffalo. Shawn is Dene’s little brother (12). Shawn was using my 375. Alan was going to let him take a Broken Horn Bull. 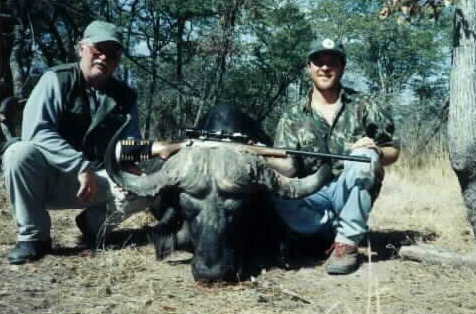 We stalked within about 50 yards of 5 Dagga Boys in the morning, but none had a broken horn. When we went back for lunch, I got something in my eyes, and couldn’t go on the afternoon hunt. In the afternoon Shawn shot his buff at about 100 yds with my 375. Nobody had a chance to get off a finisher, and the Buff disappeared, leaving a small blood trail. It was decided to pursue him the next day. The next day, my bush plane was 2 hours late, but I managed to get a driver to get me to Vic Falls on time for my flight to Jo’Burg and then to Durban to meet up with my wife. 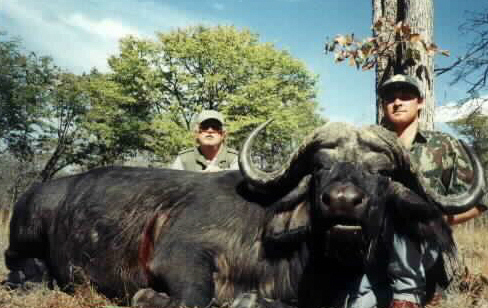 While I was flying out, Dene and Dickson (the tracker) went after Shawn’s buffalo. They tracked it down, and Dene shot it in the rump going away with his 458 and a solid. 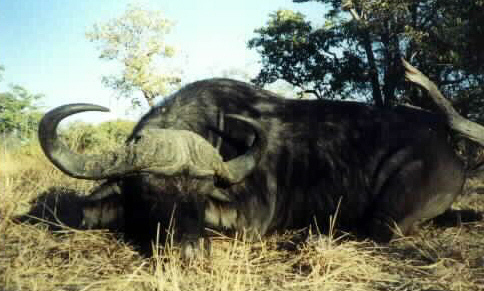 The bull turned to charge, and Dene gave it another up the snout, and Dickson shot it in the shoulder. Those shots finished the bull. Shawn’s original shot had been about 4" too far back, just creasing a lung. The Trophy Bonded bullet had stopped against the skin on the opposite side. Dene’s 458 Monolithic Solid went from rump to shoulder and stopped under the skin at the shoulder. I was met at Durban by two lovely ladies, Monique (our cook) and Lizl (the PH’s wife). They took me to Hilton Safari Lodge (headquarters for Coenraad Vermaak Safaris) where my wife was out hunting with PH Peter Gernetzky. 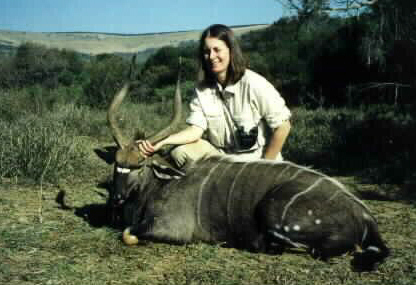 I found out on the way that my wife had bagged a very nice Nyala early in safari, and spent 4 days trying to get a Bushbuck and Waterbuck with no results. 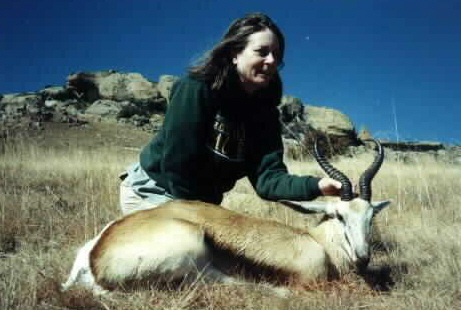 When I arrived at our lodge in Hilton, I found out Sue had just shot a gold medal Common Reedbuck. The next morning we left early for the Free State where we hunting at QwaQwa. This area is wide open, and shots were long. The first day, we just drove around checking out where the game was and made sure our rifles were on. The next day, we stalked Mountain Reedbuck, and Sue missed a couple of long range downhill shots. 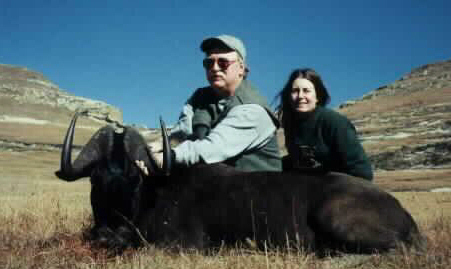 We then pursued Black Wildebeest, which Sue let me shoot. I took one at 240 yards with my 375 H&H and a TBBC after a long crawl. 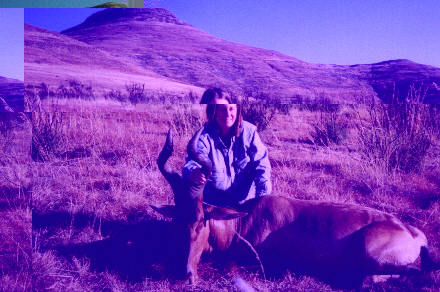 On the way back for lunch, we saw a very nice Springbok which Sue took with a 220 yd. Shot with her 30-06 and 180 Gr. Partition. 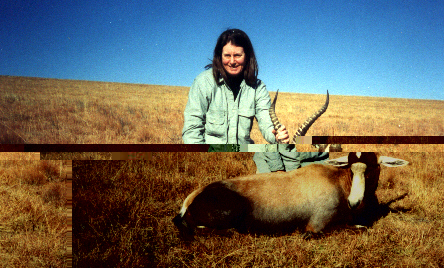 Later that afternoon Sue shot a nice Red Hartebeest after a long stalk. 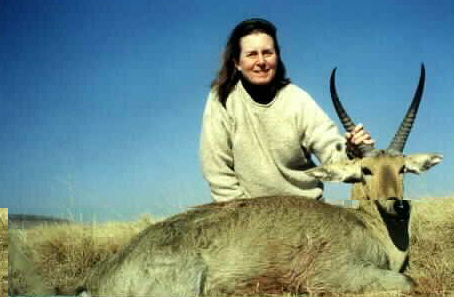 The next day Sue took a very nice Blesbok through the shoulder at 250 yds. With her 30-06. We spent the rest of the day pursuing Mountain Reedbuck. We saw several nice rams, but she never got a shot at one. The next day, we had to make the long journey home. I recommend both these companies. Hospitality is great, food is wonderful, and the hunting is very good. The Dendro Ranch has a very good supply of Buffalo; I would suggest bringing kneepads and good binoculars, I did a lot of crawling and was glassing Bulls constantly. Sue hunted 3 different areas, Northern Natal, Midlands, and QwaQwa in the Free State. Sue missed a very nice Bushbuck and Mountain Reedbuck, but she never got a shot at a Waterbuck, with the closest at 500 yds.